Compact and quiet, Kyocera Desktop Printers fits the needs of small offices and businesses. Enjoy profitable, productive, sustainable and secure technology with Gestetner. FP Mailing Solutions products help your business save precious time, improve productivity, and enhance your brand image. For the better part of a century, Standard has offered high quality, highly-reliable products. The award-winning Service Technician Team at Wisconsin Copy has over 100 years of combined experience. Let our friendly and knowledgeable Sales Team and Service Technicians assist you with your specific office equipment needs. We offer tailored, cost-effective service programs to help your business run more efficiently. After serving Southern Wisconsin for over 35 years, our customers know & trust us for all of their business equipment servicing needs. Wisconsin Copy & Business Equipment, Inc. has been in business for over 35 years, serving as one of southern Wisconsin's premier business equipment retailers and service providers. Wisconsin Copy was founded by William D. Groves in 1974. William started with 3 employees and quickly expanded his family-run-business to more than 20 employees. Now owned by Gary Keen, the company continues to provide excellent customer service and quality products to their customers. 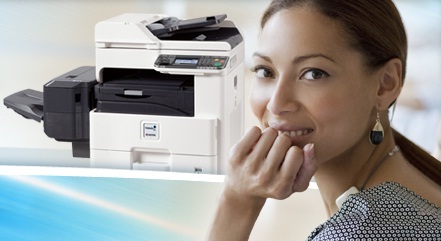 Our company offers: printer and copier repair, supplies, office equipment, copiers, printers and much more. Copyright © 2017 Wisconsin Copy & Business Equipment.